In theory, “Creatures Of The Night” has everything The Strain has been lacking and is everything the series should be moving forward. The entire episode is a condensed horror film where a group of people kill a bunch of vampires and crack one-liners like there’s no tomorrow. The parallel storylines finally converge, allowing for fresher interactions. It’s not a bad episode, and it is basically the closest to thing to an ideal version of the show. But to borrow from Paula Abdul and her anthropomorphic paramour, MC Skat Kat, it’s almost as if The Strain takes two steps forward, then two steps back, remaining in its status quo of stale dialogue and poor character decisions that overpower any of the good that the show does. A good portion of “Creatures Of The Night” is the show trying to keep from drowning in a sea of its own quality inconsistencies. Chuck Hogan’s script is full of exposition that reestablishes the rules of this show’s mythology, to the point of insulting the audience’s intelligence. With other characters joining the fray, there is a necessity in some of this repetition, but that doesn’t excuse Setrakian and Team CDC also repeating the established rules of the show to each other. After last week’s “For Services Rendered,” this should no longer be the case. This episode continues right where last week’s left off, on the subway platform after Team CDC and Setrakian have faced off with Eichorst. What ensues is a 40-plus minute mini-horror movie where the characters are forced into action. It begins with Team CDC meeting up with our favorite exterminator, Vasiliy Fet. For all of their problems, Team CDC deserves some bonus points for coming to the conclusion that simulated sunlight (in the form of UV light) is the best bet. It’s a bit touch and go the rest of the episode for them. Once they get into the gas station, it’s essentially a bottle episode, with the players trapped in the room: Team CDC, Setrakian, Fet, and hacker Dutch Velders (Ruta Gedmintas, Do No Harm), along with some other vampire fodder. The threat grows stronger as the vampires become more intelligent over time; Setrakian even gives a useful vampire lesson in explaining that, in a month, the vampires will be fully-formed. Being contained in this space for only a few hours, everyone really has to do their part, instead of sitting around, waiting to be killed. Of course, like in last week’s episode, there’s the standard horror trope of characters going against what’s best for them and ending up losing their lives for it, but by the end of the episode, the characters who matter who survive. Except for Jim, that is. 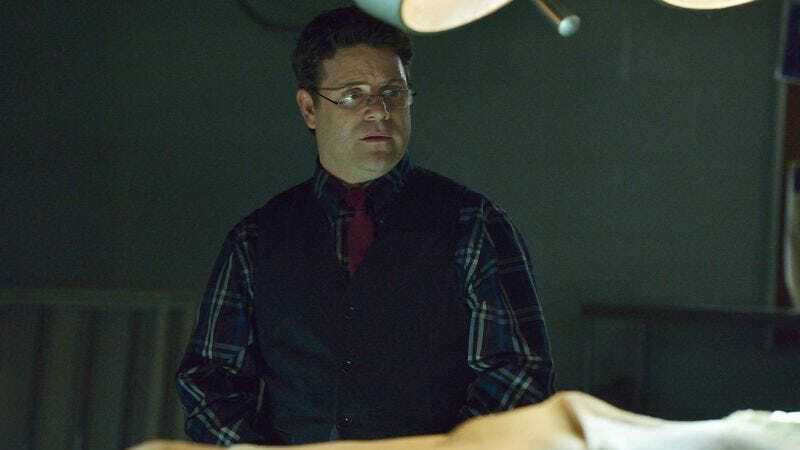 The death of Sean Astin’s Jim is obviously supposed to bear a heavy load of emotional weight, but while The Strain has done everything it can to try and make us care about any of these characters, there are no tears to be shed for Jim outside of Nora’s. It is Jim’s idiocy that allowed all of this to happen. It is Jim’s cowardice that allowed all of this to happen. Just last week—which was barely 24 hours ago in the show’s time—Eichorst had no problem pointing out that Jim was without a spine. Where the story succeeds, however, is in the fact that The Strain even goes ahead and kills him off in the first place. It would be too easy (and a little expected) for the show to just go with the easy “early intervention protocol” excuse and have Jim be perfectly fine post-worm removal; now The Strain has shown that it won’t always take the easy way out. However, one of the other characters who is partially responsible for all of the chaos in the city, Dutch the lady hacker from “It’s Not For Everyone,” is still around to fight the good fight and maybe eventually be “dead” to Eph. Despite how “hacker cool” she came across in that introductory episode, the character is already different from the rest of the characters on this show, and if nothing else, it will be interesting to see how she proceeds. Then again, she could be killed off in the next episode. Based on this episode, they all could. This is really the episode of the new best duo on the show: Fet and Setrakian. The Fet and Set Connection. For every episode Fet’s been in after his introduction in “The Box,” he’s been a fascinating character and one who is more than willing to get his hands dirty. So Fet interacting with the show’s other main protagonists and being a badass hero is a joy to watch in a show that doesn’t typically provide a lot of enjoyable moments. While Nora and Eph have both at points reluctantly stepped up to the role as the Hero of the series, Fet is more than willing to do what he does best: exterminate. Setrakian and Fet as vampire hunting best friends forever is exactly what the show needs, especially in a world where Eph continues to be the most increasingly infuriating character on the show. He’s falling right into Jack Shephard territory, with Eph as the man of science to Setrakian’s man of faith nature; there’s even the incessant back and forth, despite constant proof pointing toward the latter. The problem have never been in Eph or even Nora having compassion for others—it is in Eph refusing to listen to Setrakian, despite all of the mounting evidence in the old man’s favor. There’s no harm in Eph conceding and allowing Setrakian to call any of these creatures vampires, and yet, Eph constantly decides to argue over that when they have very little time to argue. The Strain is much better in this second half of the season than it was in its first, but it is still falling short of achieving its goals. Characters like Eph distract from the show’s potential as a legitimately good or even great show. Writing that sounds like characters have never had conversations before distracts from the show’s potential. “Creatures Of The Night” is a good episode of The Strain, but it’s still full of the show’s own distractions. Hopefully the fire at the end of the episode signals the symbolic end of such distractions. Billy Zane Hair Update: Like at the end of last week’s episode, Eph begins with The Hair being covered, but as soon as it is unleashed, it practically reads condescension. Setrakian also states that the reason why Eichorst is so advanced compared to the other vampires is that he is one of The Master’s chosen ones. “Even among the strigoi, there’s a caste system.” The entire concept of vampires in this show is so fascinating, if not slightly convoluted. I’ve accepted that Dutch was able to break all communications technology in New York. However, there’s really no need for the show to constantly remind the audience that the phones aren’t working at this point. We don’t need to be spoon-fed that information. Although, Fet provides the best technology mishap moment in this episode when he’s trying to pay for the gas. Eph: “What’s the hold up? !” Fet: “I am awaiting authorization!” That, plus his choice of premium gas on Eph’s card is just great. One of the less heavy-handed reminders of Eph’s personal problems is Dutch offering Eph a sip of beer and him rejecting it, only to eye it afterward like he wants to take it behind a middle school and get it pregnant. Setrakian’s “Fine, we’ll put it to a vote. Who wants to stay and die?” followed by dead silence is basically the way all arguments on this show should be resolved now. Keeping the Lost comparison going, there’s also the Jack/Sawyer nature of Eph/Fet, with Fet as the wisecracking brute to Eph’s supposed savior status. So, is Nora’s mom okay? Should someone check on her?